A creamy pasta dish makes a really satisfying meal and this one pairs flavourful bacon and rosemary with seasonal courgettes, all enrobed in a silky, buttery sauce. 1. Heat the Bertolli in a large frying pan and gently cook the bacon for 5 minutes until crispy. Remove with a slotted spoon and set aside. 2. Add the courgettes to the hot pan and cook for 10 minutes, stirring from time to time until tender and golden. Add the garlic, rosemary and crispy bacon, and cook for a further 2 minutes. 3. Meanwhile, cook the pasta in a large pan of water for 8–10 minutes until tender. Drain and return to the warm pan, off the heat. Add the courgette and bacon mix, cream and cheese, and toss well together until the pasta is coated. 4. Divide the pasta between 4 bowls and finish with a little more cheese and a good grinding of black pepper. 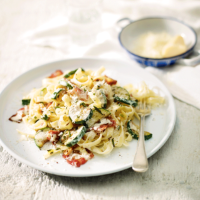 Cook’s tipSave time by swapping the bacon for a 77g pack of Cooks’ Ingredients Beechwood Smoked Diced Pancetta.